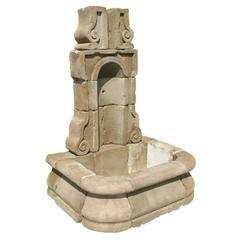 The Victorian garden fountain is of a mermaid sitting on shore-line rocks. The arm stretches upward as she holds a conch shell which is the base for the fountain. Water flows from the pipe placed in the upper tip of the shell. The fountain is made of cast concrete painted pale blue. The upraised arm can be removed. Missing paint. Slight crack in lowered arm.